Ummmmmmmmm these deviled eggs? I can’t get enough of them. I may have eaten half of them for breakfast. But we’ll talk more about those eggs in a second. We have more important things to discuss… like a surprise baby shower! It’s a surprise baby shower for my dear gal pal Stefanie from Sarcastic Cooking, who is expecting her little dude in December. And since we all can’t get together in real life to celebrate (which is a darn shame), we are doing the next best thing we food bloggers know how to do best — share our food, virtual-style (though seriously, can someone come over and help me finish these deviled eggs before I do?). I’m so glad I got to meet Stefanie in real life (with our other dear friend, Stephie… making us, yes, the three Ste(f)phs) a few months ago. Not only is she super talented and creative in the kitchen (I mean, how can you not want to eat things like Steak and French Fry Stir Fry or Bloody Mary Roasted Potatoes all day every day? ), she is just as sweet and hilarious in person as she is on her blog. She also obliged to take on any of my own weird pregnancy questions (of which I have a billion because I’m a nut), so that makes her awesome times a billion. I just hope I get to see her in person again with her little babe once he arrives! Until then, I’ll just have to talk about these deviled eggs and why they’re so good and why I wish I had an actual baby shower to bring them to because I know guests would love them. They’re creamy, thanks to the addition of Greek yogurt. They’re spicy, thanks to a dash of sriracha. And they have a great saltiness and crunch from the capers and onions. The dill just makes everything come together with its cool, mild flavor. It’s like a party in an egg, really. I think deviled eggs get a bad rap for being too boring or too outdated, but the people who say that just haven’t tapped into all the possible flavor combinations a deviled egg can have. After making these, I was instantly inspired to make dozens of more flavors — which I would have done right away, if I hadn’t already used up the full dozen eggs we had in the fridge and it wasn’t rain/snowing outside (that’s a thing right now in Minnesota, by the way. I might cry about it). But rest assured, more deviled egg recipes will be coming your way some of these days. I just can’t help myself. So enough of my rambling about eggs. Happy baby shower, Stef! Place eggs in a medium saucepan; cover with cold water by 1 inch. Heat water to boiling over medium-high heat. Once boiling, immediately remove saucepan from heat. Cover pan and let eggs sit for 12 minutes. Run eggs under cold water, then peel off shells. Slice eggs in half lengthwise. Remove egg yolks and transfer to a small bowl. Add Greek yogurt and sriracha to egg yolks; mash mixture with a fork until smooth. Stir in chopped red onion, capers and dill. Season with salt and pepper to taste. Pipe or spoon egg yolk mixture into the cavities of the egg whites. Sprinkle tops with smoked paprika and garnish with extra dill, if desired. Yum the best way to eat the egg. That filling is so creamy and chilli would set these off! I want to eat these at now! I am a lover of deviled eggs, could eat them every single day. Your add of capers (my fave!) and smoked paprika, so smartie! What gorgeous pics! So pinned. 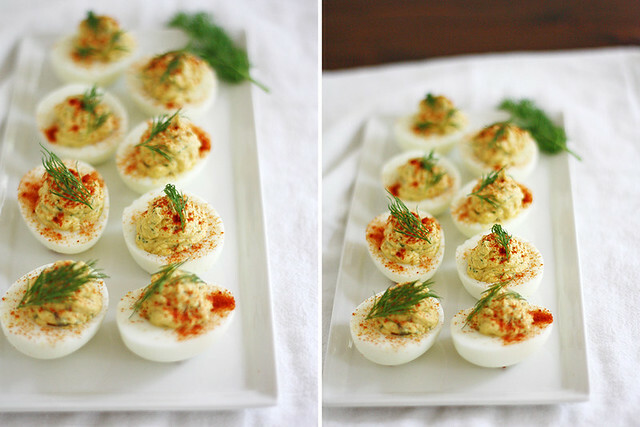 Major Deviled Egg lover here… these look too good..
Oh man! You are too sweet! I cannot wait for your baby questions! I friggen love deviled eggs! The addition of sriracha and Greek yogurt, yesssss! I wish I lived closer so we could eat these together and talk babies! I love deviled eggs — always have, always will. They are the perfect party food. Or anytime food, really. Your version with the capers sounds wonderful. I can imagine the briny taste must really enhance these! I have this thing with deviled eggs. I can’t seem to eat just one. These look fab. That filling sounds so much more fun than the usual. Restaurants around here (Boston) have actually had some deviled-egg trends going on lately. When I was a kid I was banned from eating more than four deviled eggs since I’d eat them all before anyone could get their hands on them! Love the modern twist on these and really love that you used Greek yougurt! I am huge sucker for a delicious deviled egg. These are beautiful, Stephanie! I will happily help you with those leftover deviled eggs. This is such a great addition to them and I’m all about adding Greek yogurt to my mixture! 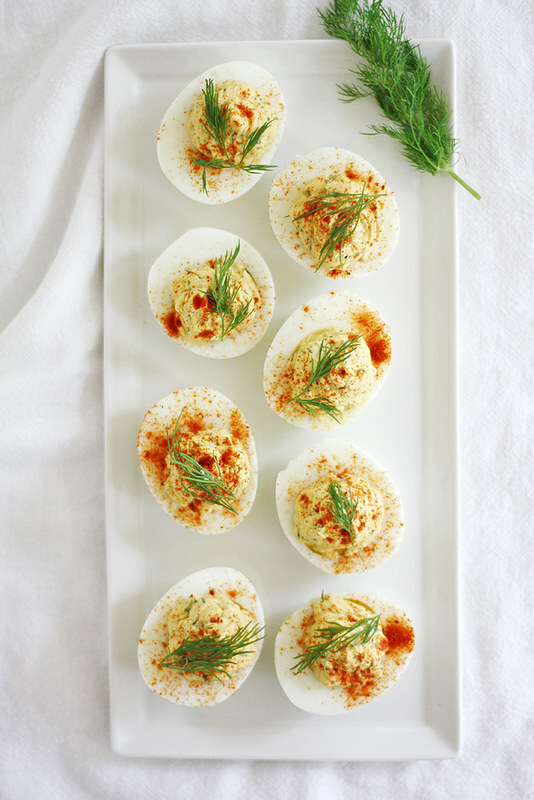 These deviled eggs look wonderful–love the capers and dill! These look like such a crowd pleaser, love the smoked paprika! What a perfect dish for a party – these deviled eggs look incredible 🙂 Love the addition of capers and dill! 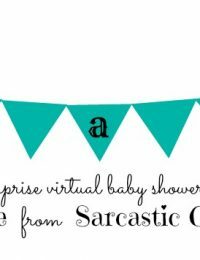 It’s been so fun seeing these virtual baby shower treats around the web!! 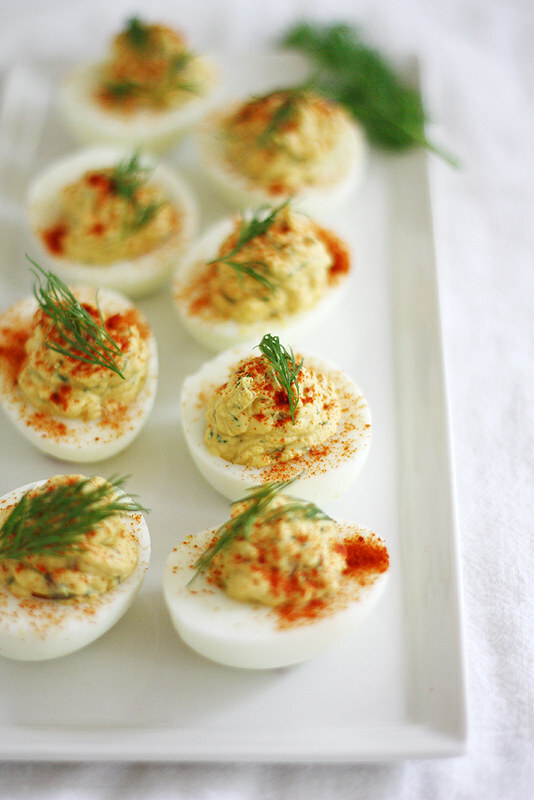 I’m coming around to the idea of deviled eggs…especially ones that are seriously stuffed as these are! Stephanie these look incredible. What a lovely mixture with greek yogurt, I bet these are delicious! My family are huge deviled egg fans, so this recipe is going to knock their socks off! These look so good. The consistency of the eggs looks perfect. LOVE deviled eggs!! They look so perfect. I could eat a whole tray! Can you believe I have never had deviled eggs before?? This looks SO good, I really want to try it sometime!